Less than three hours from Rome, the city boasts some of Italy’s best medieval and early-Renaissance art and architecture, winding stone streets, beautiful views of the Tuscan countryside, and a breathtaking duomo. And no, it’s not Florence. It’s Siena. (Warning: I think Siena’s so darn lovely, there may be photo- and gush-overload ahead). 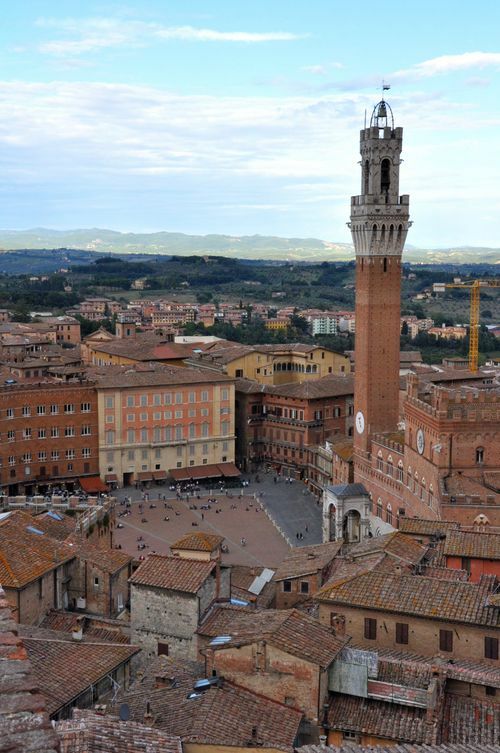 One of Italy’s strongest city-states by the Middle Ages, Siena today still appears much as it would have at its height in the 13th and 14th centuries. But while merely wandering around could keep you occupied for a full day, the city has a great deal of things to do jam-packed into its medieval walls, particularly for art and architecture lovers. And since the city reached its height so much earlier than Rome, Siena’s style is a nice antidote to Rome’s Baroque glory. 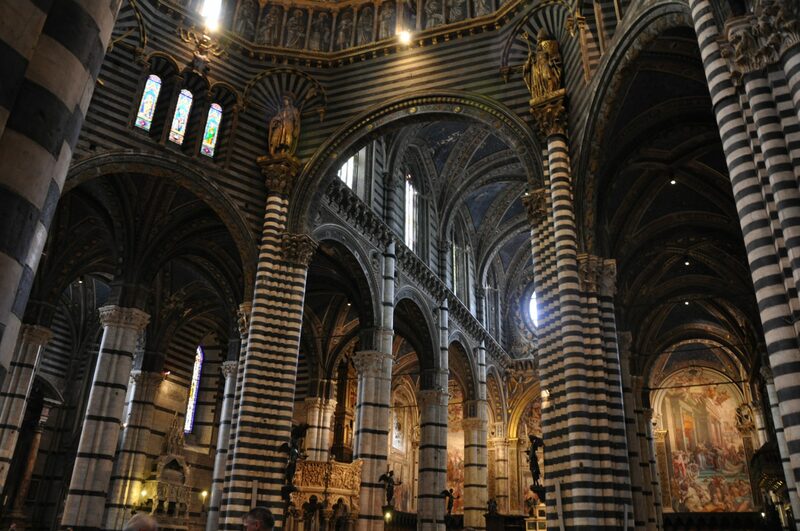 One of Siena’s can’t-miss sights is the Duomo. It took my breath away — and that’s saying something for someone who’s lucky enough to live in Rome and see St. Peter’s Basilica several times a week. Built from the 13th to 14th centuries, the list of those who contributed to the cathedral reads like a who’s-who of Italy’s most influential artists: Michelangelo, Donatello, Bernini, Nicola and Giovanni Pisano, Baldassare Peruzzi, Pinturicchio and, perhaps, even Raphael. Wow. You can’t miss the Piccolomini Library, either, almost the Duomo’s version of the Sistine Chapel for its vibrancy and incredible story-telling through beautiful scenes (below). But once you’ve done that, you’re not even done with the Duomo yet. That’s because there’s still the baptistery (boasting a baptismal font with reliefs by Donatello, Ghiberti, and Jacopo della Quercia, among others), and the Museo del’Opera del Duomo, with such gems as Duccio’s famous Maestà (1308–1311). Even more incredibly, there’s the narthex underneath the current Duomo. Part of the even older cathedral that had been on this spot first, it was discovered and excavated only ten years ago. The 13th-century frescoes from the then-entrance of the church are still incredibly vibrant. Seriously: Go to Siena for the Duomo alone. But the city boasts lots of other gems, too. 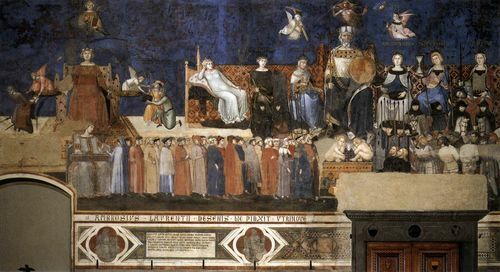 There’s the Palazzo Pubblico, the late 13th- and early 14th-century palace built as the seat of the city’s republican government, which boasts room after room of medieval and Renaissance frescoes, including the famous frescoes of good and bad government by Ambrogio Lorenzetti, 1338-1340 (below, the allegory of good government). There’s also the Pinacoteca Nazionale, with its collection of beautiful medieval and Renaissance paintings. And there’s the Piazza del Campo, the world-famous scallop-shaped central square where the equally-famous Palio of Siena is held. All of those gems, though, mean that you won’t be the only traveler in Siena. It’s no Rome or Florence (yet), but still, if you’re heading there from spring to fall, expect massive tour groups. This also means it’s a little tough to find, say, classic, non-touristy Tuscan restaurants (although we managed). But the sheer beauty of the city’s offerings is worth it. You can get to Siena by car or train. Driving from Rome will take about 2 hours, 45 minutes. There’s no direct train, but even with the change, the train takes only 3 hours; to check the Trenitalia schedule, click here. It’s doable for a day-trip, but to be able to see everything Siena has to offer, plan at least two days there. *The photograph of the allegory of good government comes via the Web Gallery of Art. All other photos mine. Gorgeous pics, Amanda! 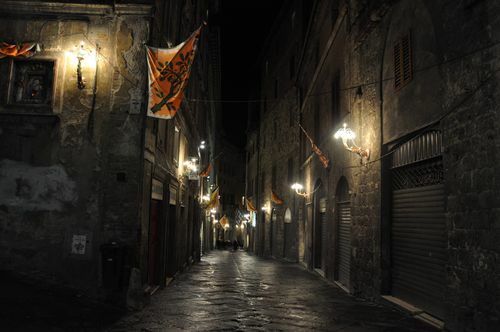 I particularly like the nighttime shot of the deserted flag-lined street. One of my favorite things to do is explore these beautiful old cities early in the morning before people are out and about; it’s a completely different (and much more special IMO) experience to wander around Bruges or Piazza San Marco at 6 am. After Rome (thanks to you I was able to get tix to the new sections of the Colosseum), my friends and I are heading to Siena for five days; do you by any chance remember the names of those “classic, non-touristy Tuscan restaurants”? Thanks, Diana! And that’s wonderful that you got tickets to the Colosseum, and are going to Siena, too. 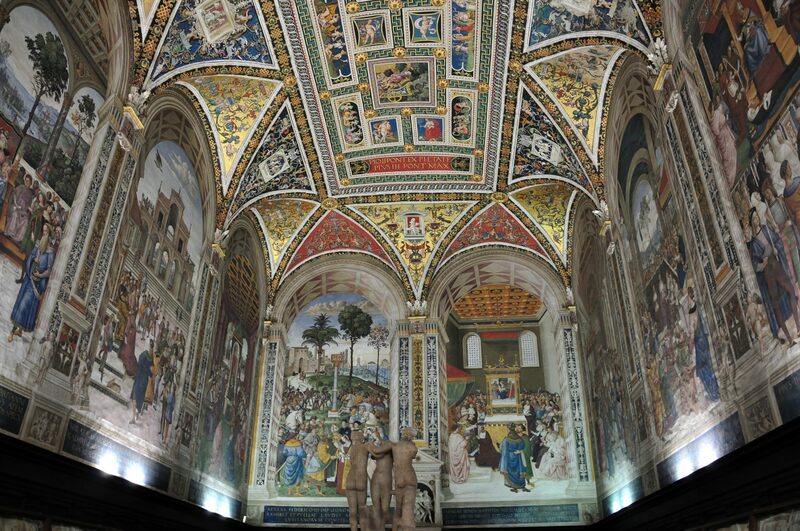 A very good choice, and lots of great day trip options from Siena, too. The restaurant we found that we really liked in Siena was Antica Trattoria Papei, a cozy family place serving traditional Tuscan food on Piazza Mercato. Would definitely recommend. Hope that helps, and enjoy your trip!